Wednesday - All about community theater and how FREAKING ADORABLE my husband is. So there you have it. A list! How I love lists. Ok, so the hafla. Gosh, I love dance. I'm so, so grateful to have rediscovered this love in my adulthood. This hafla was really nice because there was Egyptian dance, Indian Bollywood dance, and Spanish Flamenco, all in one show. Outstanding. Our troupe wing number was first, and this particular number really stresses me out. :0 There are drop ceilings in the studio, and with the addition of an audience taking up space, using wings of Isis is just dicey. It went fine, but at one point, the tip of my right wing collided with someone else's and fell out of my grasp. No biggie, but trying to beam at the crowd while fumbling for my wing again wasn't exactly what I wanted to be doing at that particular moment. I recovered well. Then I changed into my fantastic bright orange set and awaited my solo. 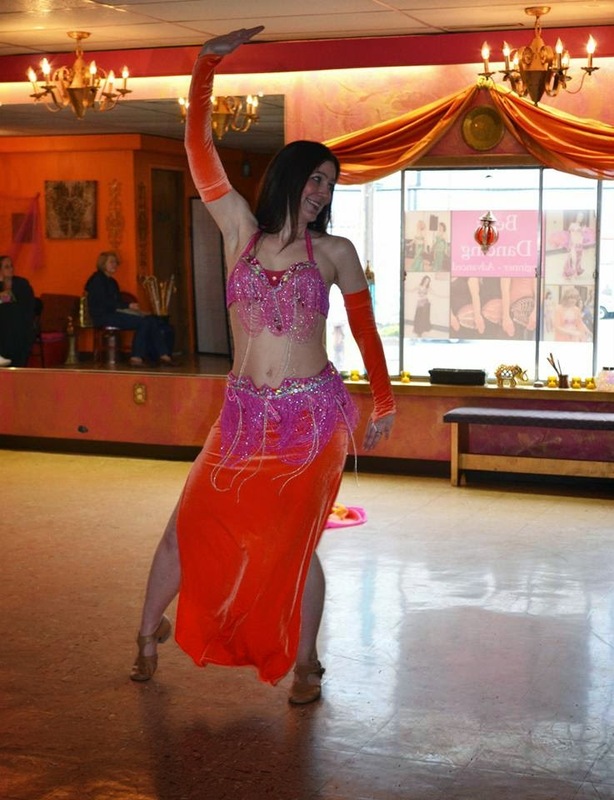 In the interim, the other belly dance classes danced, and one of the Flamenco classes. Then I was up, and I was hoping my sore calf muscle would cooperate. I'm pleased to report that everything went super well. :) Although it let me know of its impending unhappiness about halfway thorough, my calf was fine. I just made a concerted effort not to jump or put all of my weight on that leg unless absolutely necessary. My number was what I call "loosely choreographed" in that I had whole choreographed segments, but others where I improvised, and still others where I started doing something different than what I had choreographed and just went with it, because seriously, who cares? :) The whole point is to get into it and joyfully/confidently interpret the music, that's what the audience will remember and appreciate. In the moment, I remember thinking to myself "Oh, why am I doing a shimmy here? Ah, doesn't matter." :0 Which is a good feeling, truly. The tables are set up for these shows in the round, and now that I can improvise, I make a real effort to move around the room and not always just face forward. I've also been working on my performance skills, if you will, meaning to connect with the audience more. No easy feat for an introvert, I'm sure you know. Well, I had a highlight on Saturday night. I had been over to the left side of the room a few times and noticed a little boy sitting there, around 4 or 5 years old. There was also a little girl over on that side, in the 8 year old range, and she had the stoniest face this side of The Exorcist. I have *never* seen a more unhappy audience member. Let's just say I didn't visit her a second time. :0 But that little boy captured my heart. He was so cute and attentive, and so I danced over to him again before I finished the song. When I caught his eye, I smiled at him as I danced. He lit up like candle, waved to me, and whispered "HI!" I saw an immediate reaction amongst the other nearby audience members, who exclaimed happily at the exchange. I also had lots of smiling faces in the front and back of the room, which I knew meant that I was projecting my own happiness through my eyes and smile. THAT made my night. My favorite performance to date.